One magnificent spectacle of nature that recurs every fall in Central Oregon is the spawning of kokanee salmon in the tributary streams of local Cascade lakes. Though an introduced species, these landlocked, lake-dwelling sockeye salmon are no less impressive. Several local streams have kokanee runs in the fall, but three tributaries of Crane Prairie Reservoir — the Upper Deschutes, Cultus and Quinn Rivers — are less-visited, beautiful and easy to access. If looking for an outing on a warm, sunny day in late September or early October, these three kokanee spawning sites are worth a visit. The spawning fish are remarkable in themselves, but an understanding of their 4-5 year life cycle can add to one’s appreciation. Interestingly, the adults all return to spawn in the same stream in which they were hatched 4-5 years earlier. But it’s not the same fish returning each year, since the adults die after spawning. The kokanee that show up in Crane Prairie’s tributaries in a given year are also not all of the lake’s adult fish, but just the one-quarter to one-fifth of the population whose 4-5 year life cycle compels them to spawn that year. In the spawning tributaries, the fish require gravel substrates, where the female can scoop out a shallow nest (called a redd) by digging with her tail. She will lay from 200 to 2,000 eggs, which are then fertilized by a male kokanee, after which they both die. The fertilized eggs develop in the gravels during the winter months, hatching into tiny alevins in February. These alevins don’t need to eat, as a yolk sack provides all their nutrients until they mature into fry and emerge from the gravels. As the fry emerge, they’re immediately swept downstream into the lake, where they subsist on plankton near the lakeshore. As they develop into parrs and smolts, these fish migrate into the colder and deeper waters of the lake, where they mature into adult silvers. place to see the greatest number of spawning kokanee at Crane Prairie is above and below the Cow Meadow bridge over the Upper Deschutes River (see map download below for driving directions). 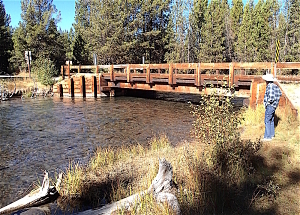 The view from the bridge itself offers a good first introduction, with hundreds of 12”-18” salmon spread out across the gravel stream bed. Below the bridge, trails extend along the grassy banks for about 350 yards downstream to the river mouth at the reservoir, with views of spawning fish. However, the very best place to observe the kokanee up close is about 100 yards upriver from the bridge at the stream gaging station, following trails along the grassy east bank. Here the water is calm and clear, with distinct views of the colorful fish and their nest building and breeding activities. Surprisingly, they are unfazed by human presence. 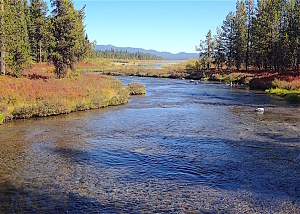 and lacks the powerful, driving flows from spring snowmelt that flush out the Upper Deschutes, the Cultus River is choked with old downed trees. 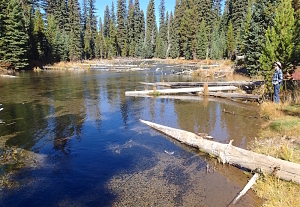 This makes hiking upstream and down difficult, but the water is quite still and clear, allowing up-close views of the spawning kokanee from careful perches out on the downed logs. For the best chance of seeing bald eagles in action, don’t drive right up to the crossing at first, but park 50 yards away on the far east side of the gravel parking area, and then approach quietly on foot. 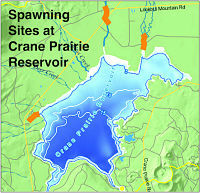 Arguably the most beautiful and intimate setting to see spawning kokanee at Crane Prairie is at Quinn River, on the west side of the reservoir (see map download). From a gravel parking area at the south end of the Quinn River Campground, one can follow the signed Osprey Point Trail for 30 yards south to the river’s headwater springs. From here, there’s a streamside trail running for 250 yards down along the north bank, with excellent views of the spawning fish. Within about 60 yards, one comes to a stream gaging station and a steel footbridge across the river, which is especially suited for fish viewing. Above the footbridge, the water is still and clear and the colorful fish stand out in detail — but since the substrate here is silty, there’s not much actual spawning activity. All the action is below the footbridge, where the stream flows over gravelly riffles for more than 150 yards down to the reservoir, and is filled with spawning kokanee spread out from bank to bank.